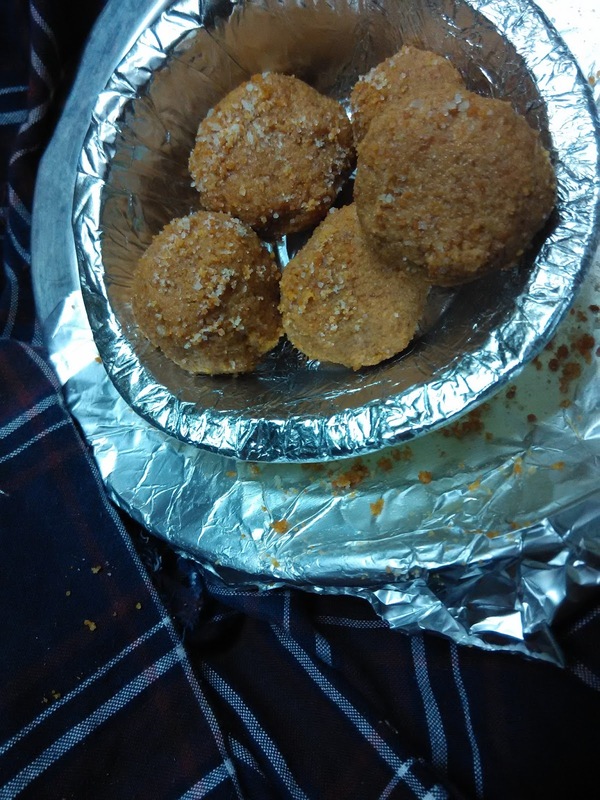 Visited Vrindavan recently and fell in love with the uniqueness of Mathura peda. Since then I have been wondering how to make this peda typical of Mathura. Surprisingly, this form of peda is prepared in Karnataka's Dharwad. 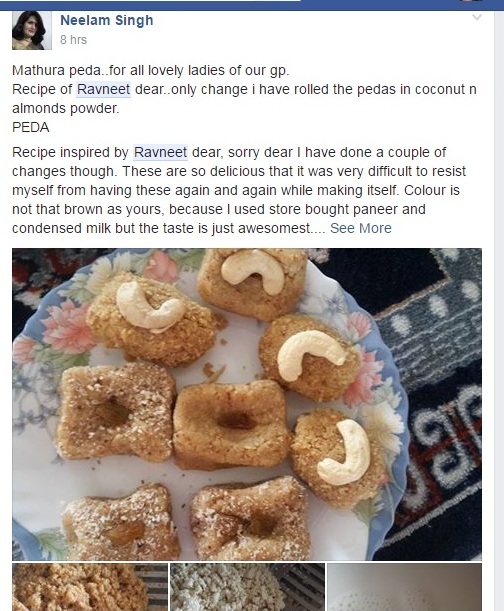 I did not know this until a dear friend of mine, Radha Natarajan, shared the recipe of Karnataka peda. What more could I ask for? 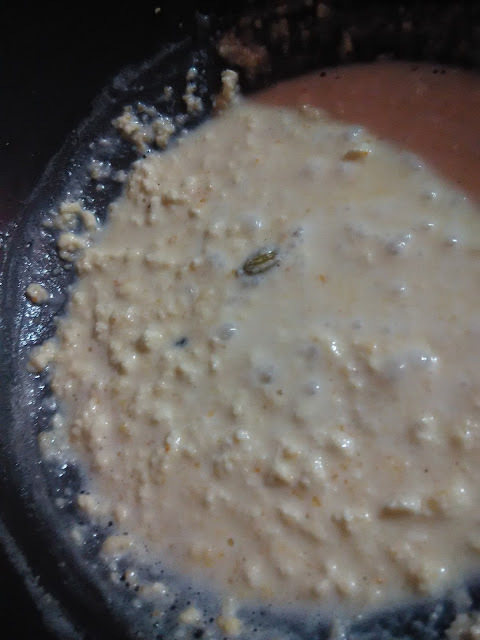 I tried to replicate her recipe and the result is before you. 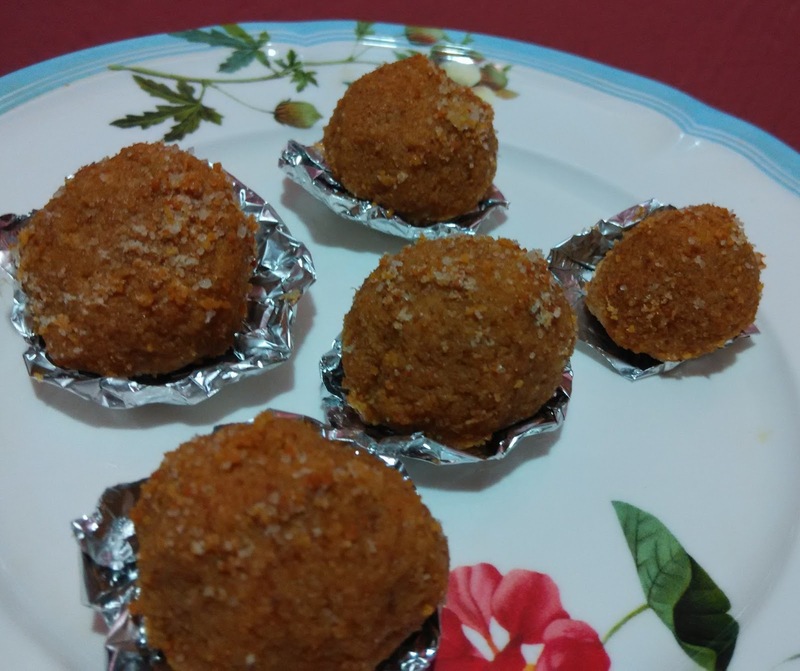 Her peda recipe inspired me to give it a try and relive the taste typical of Mathura pedas. The festival of light is knocking at our doors, and we are all geared up to celebrate our favorite festival. We all love to make diwali sweets, distribute diwali gifts, and share love with each other. Not to forget the cracker mania! !I do not like crackers, so I see it as mere waste of money. On top of it, the air and sound pollution are benumbing. Anyway, let's see what magic you can create this diwali. 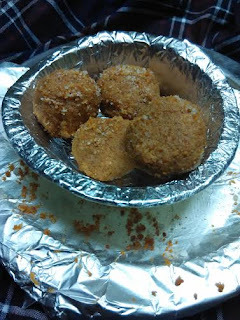 Mathura peda is one delicacy that is a favorite with everyone. This Mathura peda makes a special festive gift as well. Surprise your friends with this Mathura-special treat this Diwali! 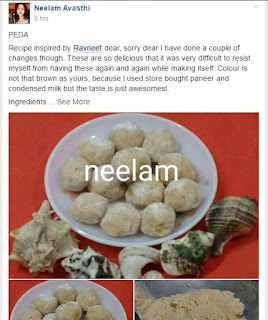 Of course, there will be some difference between the handiwork of professionals and novices like me, but there is no better feeling than getting a near-perfect recipe in your first attempt at making a delicacy, which is world famous for its taste, unique fragrance, and richness. 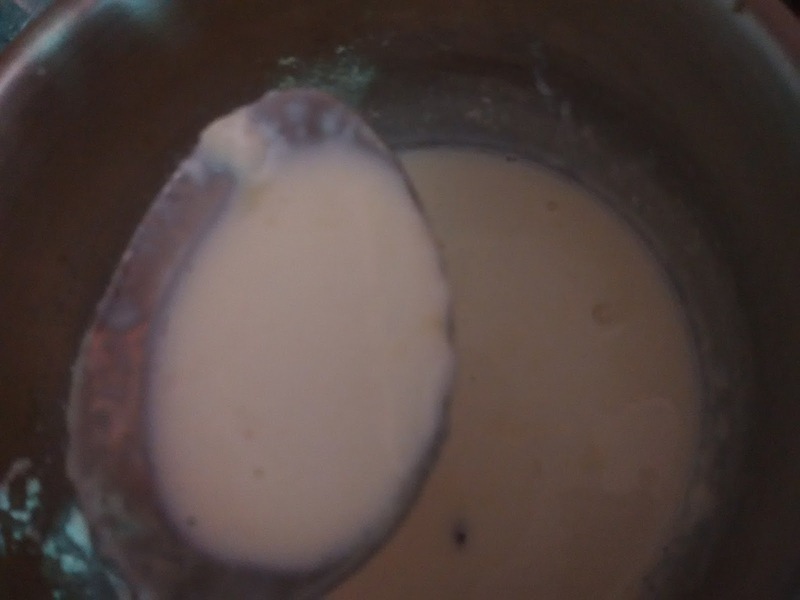 It took me more than an hour of continuous stirring to churn this out. But the end product was worth all the efforts. 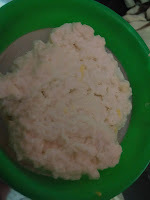 I took half cup of paneer (cottage cheese) and 1 cup of condensed milk (made at home) for the recipe. 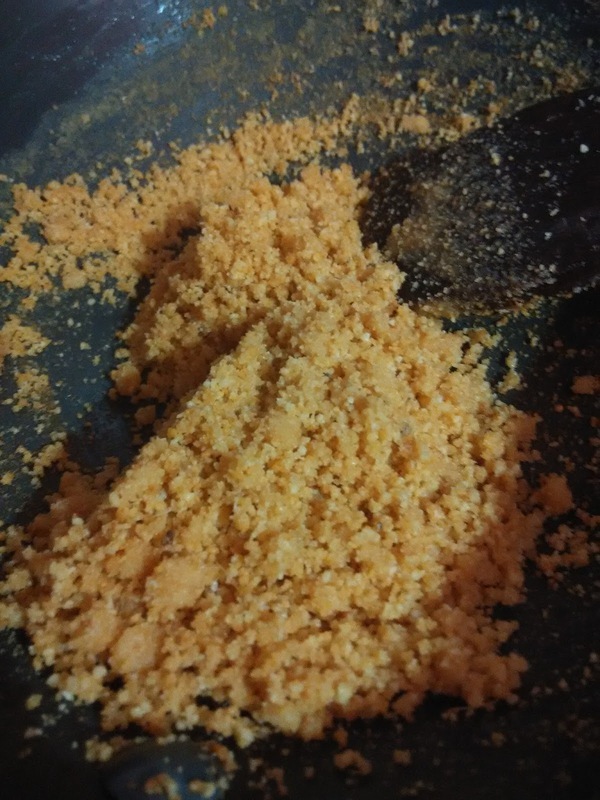 The best thing about this delicacy is that it's not as sweet as other Indian sweets, but yes, it is loaded with calories, since it is a completely dairy preparation. Nevertheless, it won't hurt once in a while to have this traditional Indian sweet. But the taste is so divine that you cannot have just one. 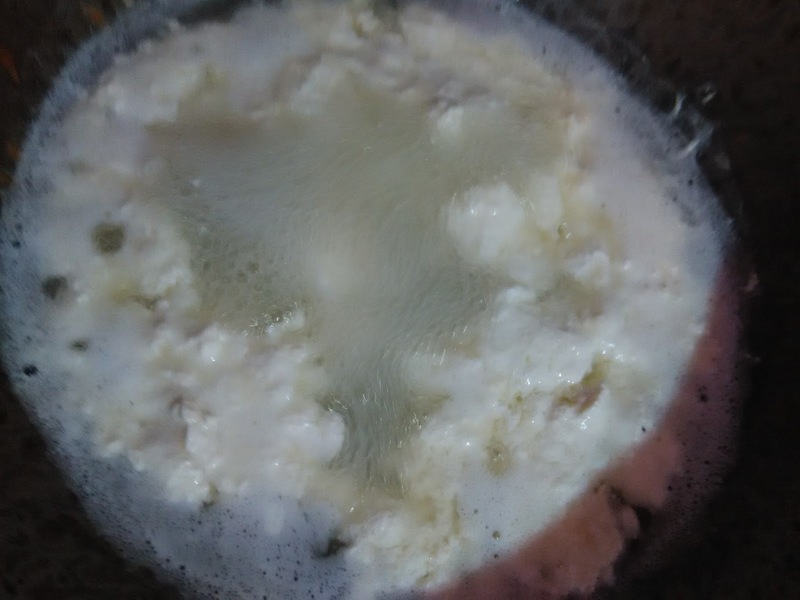 I made paneer by adding 2 tbsp of curd in milk and allowed it to curdle. 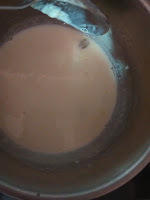 Then I took a tea sieve to filter paneer from whey. 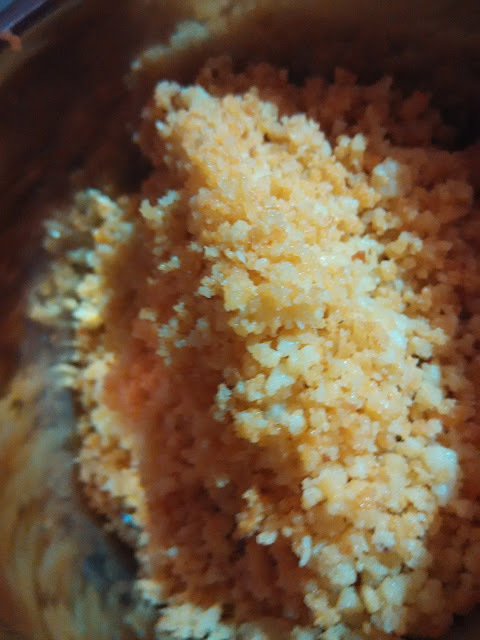 Whey can be used to knead regular dough. I even add it into curries sometimes. Once you have paneer churned out. Wash it with cold water, especially if you prepare it with lemon. Take a nonstick pan, add 1/2 tsp of ghee. Add paneer and keep stirring until it dries up. Add condensed milk only after paneer feels dry. It should not have any moisture. 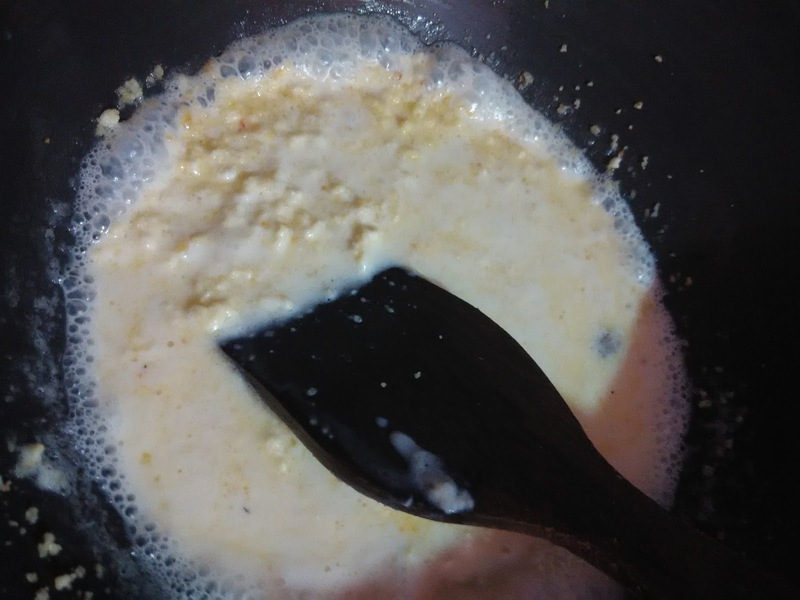 After adding condensed milk, keep stirring until it evaporates and the color of paneer changes from white to creamish brown. When done, allow it to cool. 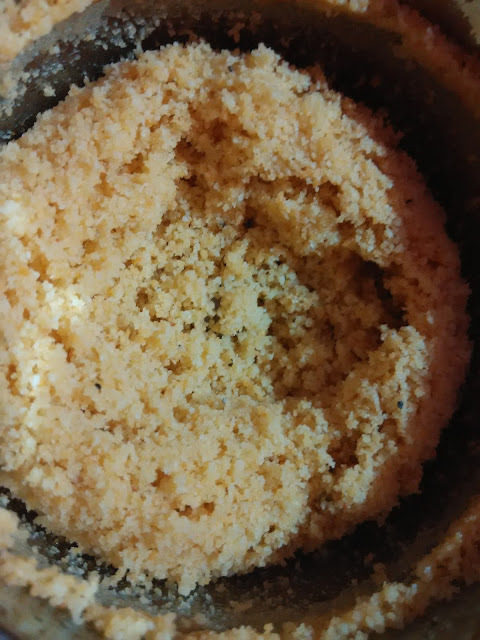 When the mixture has cooled down, grind it in a mixer-grinder. Of course, you may be tempted to taste it at this stage. I must tell you that the mixture tastes equally good even at this stage. 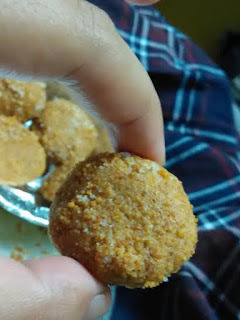 But since our goal is to make peda, you have to resist the temptation of relishing a bite at this stage. 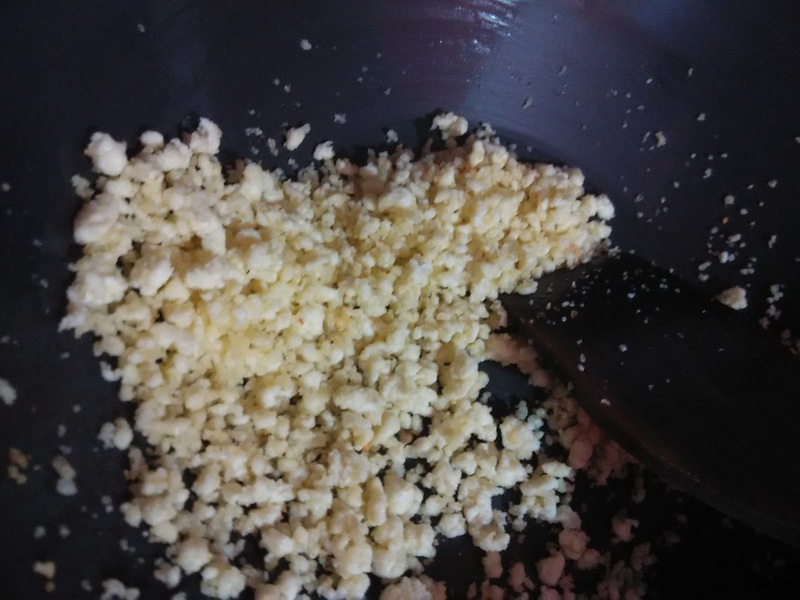 If it feels dry, add little milk and then grind until it forms like a paste. 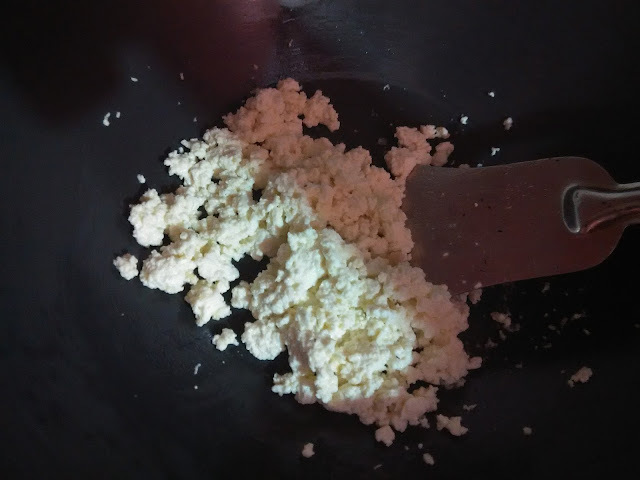 In my first attempt, I did not add milk while grinding and paneer turned dry after grinding. Again take the same pan and roast the ground mixture. 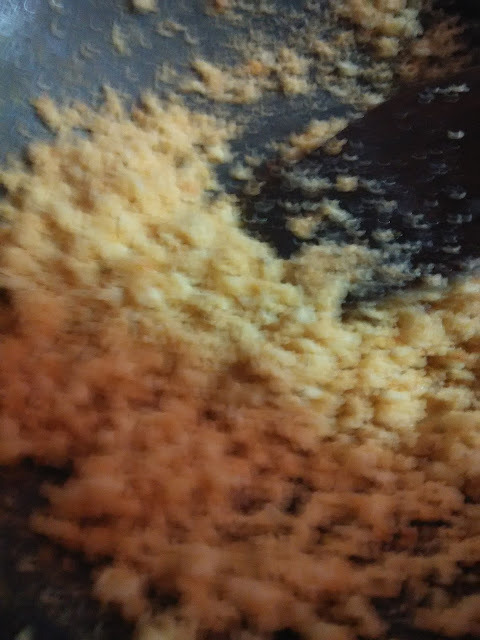 Repeated frying will ensure that we get the typical peda color. If required, you may add little ghee at this stage, especially if the mixture feels dry. 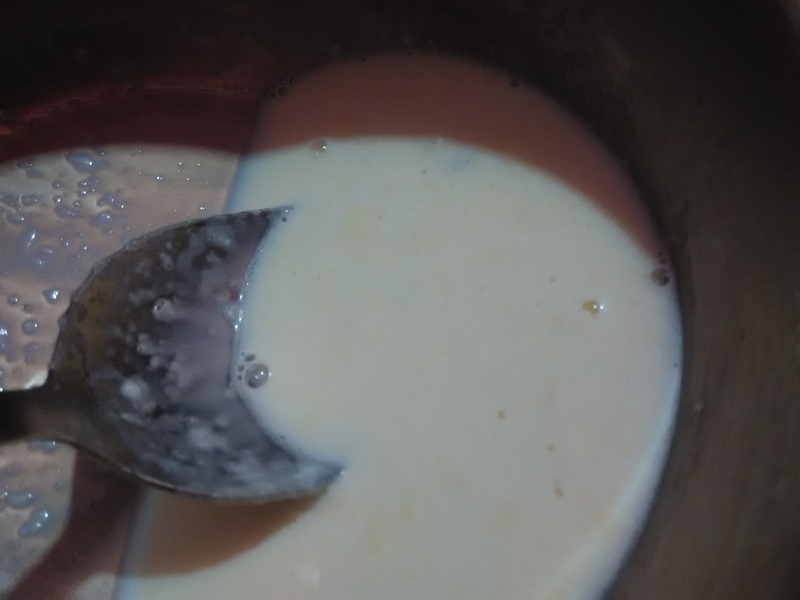 But if you add milk while grinding, you may not require ghee at this stage. Keep stirring until you get the color you want. Switch off the flame and let it cool little. 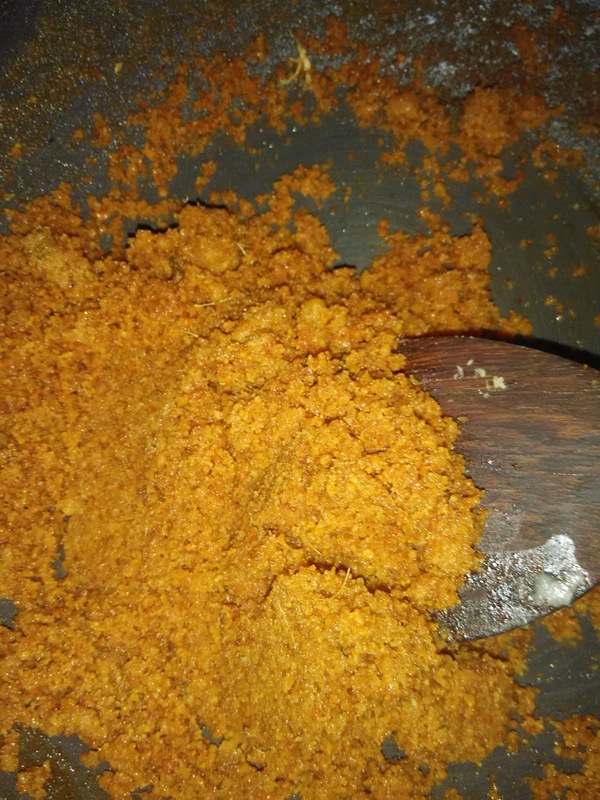 We need the dough little warm to give it the shape of peda or ladoo. 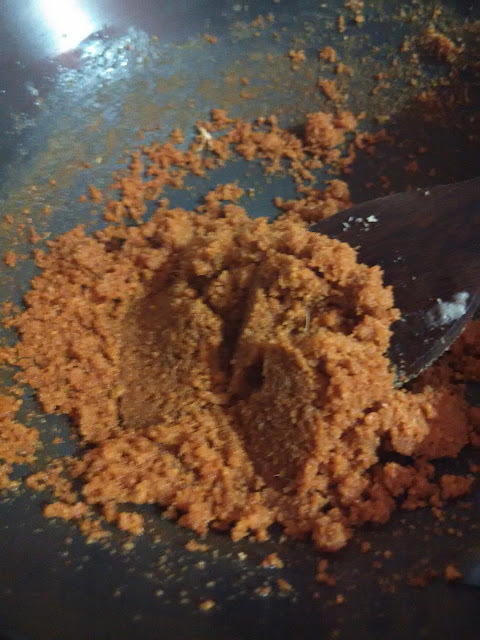 Sprinkle little sugar powder over a tray and try to roll the pedas over the sugar mixture. Enjoy this traditional delicacy at any time of the day and serve it to your guests as well. 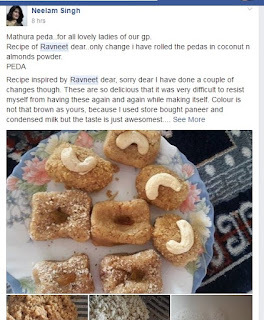 Here's my take on oats peda. Check the recipe here. So how are you celebrating Diwali and what are you planning as Diwali sweets as well as Diwali gifts? 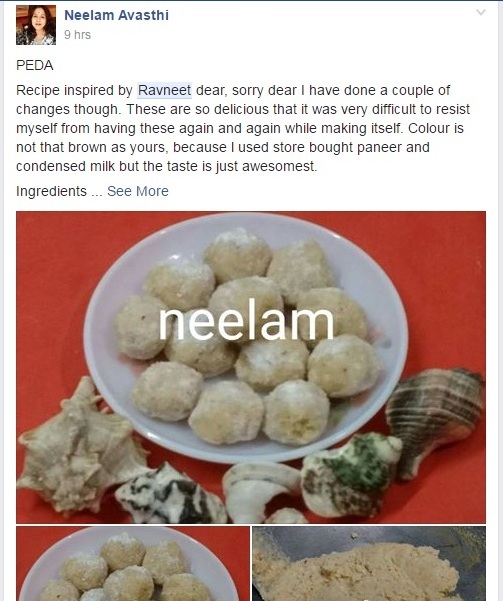 Would love to hear back from anyone who tries this recipe. Thumbs up to ur efforts.